Mack Wilberg Carols composed by Mack Wilberg (1955-). For SATB choir and piano/organ/orchestra (Carol to the King: 3 flutes (+piccolo), 2 oboes, 2 clarinets, 2 bassoons, 4 horns, 3 trumpets in C, 3 trombones, tuba, timpani, percussion (snare drum, triangle, bass drum, suspended cymbal, tambourine, bass drum, chimes, glockenspiel), organ (optional), ). Mixed Voices. Composer Carol Collections. Christmas, Choral Collection, Sacred. Vocal score. 80 pages. Published by Oxford University Press (OU.9780193870161).ISBN 9780193870161. Christmas, Choral Collection, Sacred.For SATB and piano or organ or orchestra. 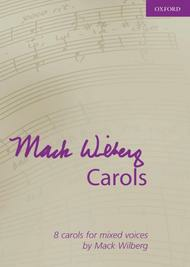 This exciting and diverse collection features eight of Mack Wilberg's popular arrangements for the Christmas season. These carols have been revised with new scorings for SATB choir and piano or organ expressly for this collection. Whether fast and upbeat or steady and warm, this music reveals Wilberg's talent for arranging and will be a welcome addition to Christmas programming for choral societies and church choirs. Orchestral material for all the carols is available on hire from the publisher.